The provincial government established Charlie Cole Creek Ecological Reserve (E.R. #102) as an ecological reserve on April 9, 1981 by Order-in-Council 875/81 under the authority of the Ecological Reserve Act. The Protected Areas of British Columbia Act provided legislated status to the ecological reserve boundaries on June 29, 2000. The ecological reserve covers 162 hectares on the Kawdy Plateau, and lies within the Teslin Basin Ecosection, and the Boreal White and Black Spruce Biogeoclimatic Zone. This is the only ecological reserve within the Yukon River drainage in British Columbia. 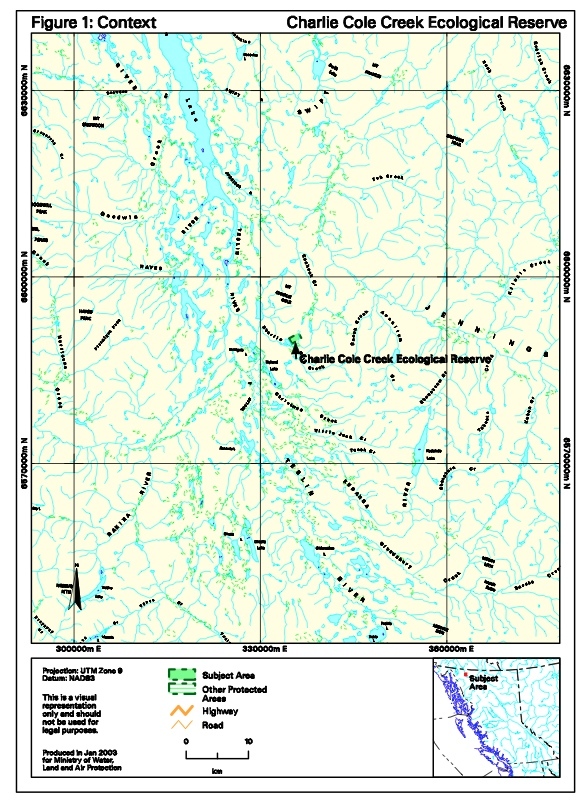 The Teslin Tlingit Council and the Taku River Tlingit First Nation identified Charlie Cole Creek Ecological Reserve as being within their asserted traditional territory. Charlie Cole Creek Ecological Reserve protects three cold-water mineral springs and their associated landforms and vegetation. These springs are rare in northern British Columbia, with one spring having formed an elevated circular cone 20 metres in diameter and 6.5 metres high. The crater of this cone is filled with water and has springs in the bottom. The calc-tufa rock that makes up the cone is lightweight and crumbly, and is formed by the deposition of calcium carbonate on plant roots and other organic matter. The decomposition of the organic material has left the calc-tufa honeycombed and sponge-like. The other two springs have not formed cones but have left red and yellow deposits downstream of the springs. The calcium-rich deposits left by the springs have numerous plant species associated with them that are either rare or at the outer limits of their geographical range. These plants in turn form rare and/or unusual plant communities that are not listed here because they have not been completely inventoried. The remainder of the ecological reserve contains glacially shaped landforms with undulating and subdued relief. Charlie Cole Creek Ecological Reserve is located near the south end of Teslin Lake, 100 kilometres east of Atlin and 150 kilometres northwest of Dease Lake. 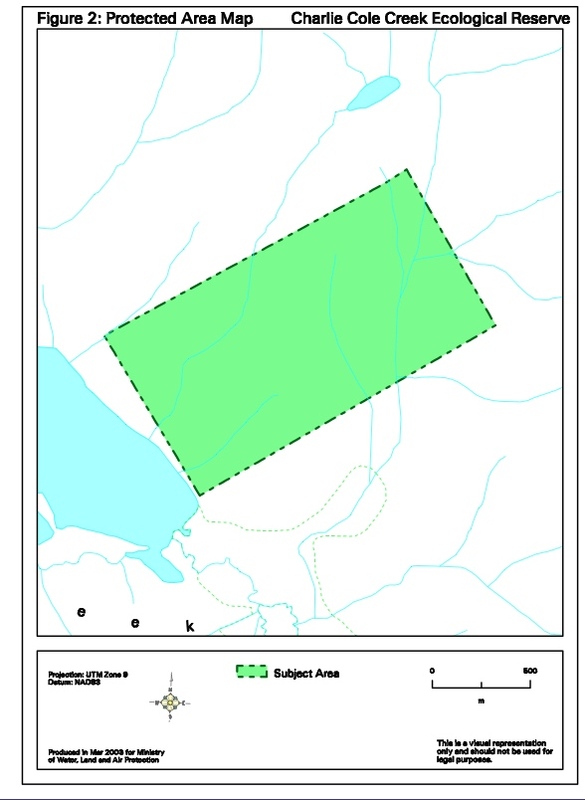 The nearest protected areas to Charlie Cole Creek Ecological Reserve include Tuya Mountains Provincial Park located 75 kilometres to the southeast; Atlin Park 90 kilometres to the west; and Boya Lake Park 150 kilometres to the east along Highway 37. • Protects three cold-water springs and associated mineral deposits, including one that has formed 6.5 metres high cone with a 20 metres diameter crater; these springs and their associated formations are provincially significant geological features. • Situated within the very poorly represented Teslin Basin Ecosection. Only 0.03% of this ecosection is represented by protected areas. Charlie Cole Creek Ecological Reserve is the only protected area in the underrepresented Teslin Basin Ecosection. • Lies within the well represented BWBSdk1 (Boreal White and Black Spruce zone Dry Cool subzone Liard variant) Biogeoclimatic Zone (21.95%); this ecological reserve contributes minimally to this representation accounting for only 0.05% of the total protected area representation of the BWBSdk1. • Preserves unusual and provincially significant plant communities associated with the mineral springs and calc-tufa deposits. • Protects mineral springs that are used by wildlife as mineral licks. • Presents potential for scientific research on the geological and developmental history of cold- water mineral springs, and the distribution of plants related to calcium-rich soils. • Offers little opportunity for educational uses because of the ecological reserve’s remote location. • The Archaeological Inventory Data Centre has no records of archaeological sites within the boundaries of the ecological reserve. • First Nations may have completed traditional use studies which may provide additional information. • Protects a provincially significant geological feature that is rare in northern British Columbia. • Conserves a rare habitat type that contains at least two rare plant species. Charlie Cole Creek Ecological Reserve is extremely remote and access is difficult. Access can be gained by helicopter or by boat along Teslin Lake and up Teslin River to Hutsigola Lake, followed by a seven kilometre walk to the ecological reserve. • No existing tenures, alienations or encumbrances affect the ecological reserve. • The adjacent lands are mostly used for hunting, trapping and recreational activities. No industrial land use occurs in the area. • A letter from BC Parks in 1999 indicates that a buffer be placed around the ecological reserve in any commercial backcountry recreation permits. • The Teslin Tlingit Council and the Taku River Tlingit First Nation indicate that Charlie Cole Creek Ecological Reserve lies within their asserted traditional territory. • Ministry of Water, Land and Air Protection, Skeena Region Fish and Wildlife Science and Allocation Section has an interest in wildlife species in the ecological reserve. Lies within Wildlife Management Unit 6-25. • Ministry of Sustainable Resource Management (British Columbia Conservation Data Centre (CDC)) has an interest in rare species and species at risk in the ecological reserve. • Residents of the region and the communities of Dease Lake, Atlin, and Good Hope Lake have an interest in the ecological reserve because of its contribution to conservation in the region. • Federation of British Columbia Naturalists have an interest in the ecological reserve because of its protection of significant natural features. • Education and scientific research institutions have an interest in the ecological reserve because of the rare plant species and the special ecosystems associated with the mineral springs. • Friends of Ecological Reserves have an interest in the ecological reserve because of the rare plant species and the special ecosystems associated with the mineral springs. The primary role of Charlie Cole Creek Ecological Reserve is to conserve three cold-water mineral springs and their associated landforms and vegetation. The ecological reserve serves a secondary research and education role by providing opportunities for the study and research into the development of cold-water mineral springs and their associated plant communities. The ecological reserve’s flora and fauna, especially rare plant species and plant communities, may be at risk because of the lack of inventories and mapping. The plant communities associated with the mineral springs may be at risk because of the lightweight and crumbly nature of the calc-tufa deposits they grow on. Unauthorized use of the ecological reserve may be occurring but is not detected because of a lack of ranger patrols and an ecological warden. The calc-tufa deposits that make up the cone and surround the springs are fragile because of the soft crumbly nature of the deposits. • The ecological reserve’s cultural heritage values may be at risk because an inventory of these values does not exist. Visitors to the area may be unaware of the area’s ecological reserve status because the ecological reserve’s boundary is not signed. Complete an inventory of the ecological reserve’s flora, fauna and important habitats. Priority must be given to species-at-risk, rare plant species and rare plant communities. Ensure that any inventory, research or educational activities do not harm these communities or the substrates they grow on. Reassess the 1997 fire management plan to determine whether “initialattack” is the desired policy for this ecological reserve. Ensure that any use that occurs in the ecological reserve does not impact upon the integrity of the mineral springs, cone and associated deposits. Investigate and collect information on cultural heritage values, and work to protect these values. Nation’s traditional use studies for this area. Ensure the Ministry of Water, Land and Air Protection web site continues to provide accurate and current information about the Charlie Cole Creek Ecological Reserve. Ensure that signage is in place to notify visitors of the area’s ecological reserve status. Environmental Stewardship Division will continue to consult with all interested First Nations and other stakeholders regarding management of this ecological reserve. Environmental Stewardship Division considers Charlie Cole Creek Ecological Reserve of low priority for the development of a management plan with full public involvement. This management direction statement will be reviewed and revised, if necessary, in five to seven years.